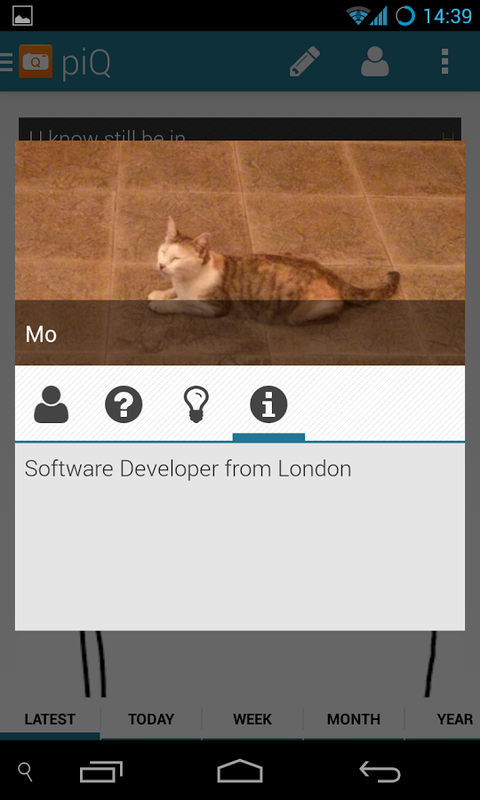 piQ is a question answer app where you can quickly and easily ask questions with pictures. 1. You come across an object and you don’t know what it is, or how it is used, or why it is there. 3. Wait a few minutes while others browsing the app sees your question and answer it. When someone answers your question, you will get a notification. While waiting for your answer you can also answer picture questions asked by other users. Users are invited to take pictures of objects and things that they come accross or see in their everyday life but do not know what the object is or what it is used for. For example, a user can take a picture of a tree and ask, what type of tree is this? Other users of the app can then reply to the question with their answers. Answers can be voted by other users either up or down, the top rated answers are then shown on the top of the answers list. This is similar to the mechanism Reddit employs in their comment system to siv out the good answers from the bad. In summary piQ is a question answer app powered by its users. It makes asking question very simple and quick.